Enerpac (A Division of Actuant Corp) specialises in supplying high pressure hydraulic equipment. As nations worldwide improve their oil and gas infrastructure to reduce dependence on imports, Enerpac Integrated Solutions is providing sophisticated lifting and positioning technology for various tasks. The Enerpac project using computer controlled Synchronous Lifting Technology also employed in Australasia and the Asia Pacific involved erection of three large, spherical vessels intended for storage of liquefied propylene, butane and butylene. One of the final fabrication steps required heat treating the 550 ton steel vessels in order to relieve welding induced stresses. However, heating the 53 foot diameter spheres, each supported by 12 cylindrical legs would have caused additional stresses to legs and their points of attachment to spheres. It was clear that when the spheres had to be heat treated, the bottom ends of legs had to be free to move in a horizontal plane so as to accommodate thermal expansion. Placement of temporary sliding surfaces under the sphere legs required lifting each of the structures a nominal nine inches off the already placed supporting pedestals. Metalworking subcontractor ICA-Consorcio Industrial contacted Enerpac for advice and lifting equipment. Together with distributor Equipos y Maquinaria de Monterrey, Enerpac personnel recommended a Synchronous Lifting System. Since the vessels were empty, the lifting could be accomplished by picking up each sphere by six of its 12 legs. 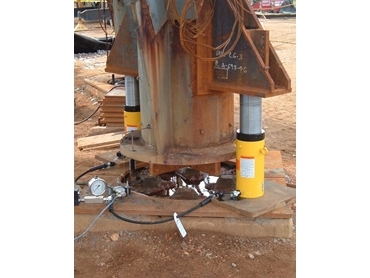 Lifting muscle was provided by a pair of 100-ton jacks positioned at alternate legs. The 1200 tons of lifting capacity provided a 2:1 safety factor relative to the vessel weight. Additionally, use of locknut type cylinders provided fail safe operation. Digital controls provide simplicity and enhanced safety. Each sphere lift took about a half hour, and vertical position accuracy was maintained to within 1 mm at each lifting point. The digital hydraulic control system (Synchronous Lifting) produced the combination of speed and accuracy. Consorcio Industrial successfully lifted each vessel and then lowered it onto the temporary sliding surfaces. After the heat treating was completed, vessels were again lifted for removal of the temporary sliding surfaces, and then lowered into permanent position on concrete pedestals. Manually operating the 12 jacks used for each lift would have required intense coordination, and the possibility of human error was also considered. In this project, people involved had only to watch and monitor a control display as the synchronous lifting controller both monitored the precise position of each lifting point and also automatically controlled the hydraulic supply to each pair of cylinders. In addition to speed and accuracy, the safety implications are obvious.